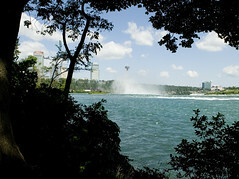 We spent the weekend in Niagara Falls, Ontario. We enjoyed ourselves, but were disappointed to find that the tourist portion of the city has become little more than a midway. Our best time was spent upstream from the noise or downstream hiking through the parks. I don't have all the photos processed yet, but I didn't find much worth of shooting around the falls. Look for the few good images I dot to start popping-up on Flickr.